Madame Rochas (1989) is a popular perfume by Rochas for women and was released in 1989. The scent is floral-chypre. It is being marketed by Inter Parfums. Actually, this scent that I just sprayed on shouldn't be in my hand at all - actually the vintage version of Femme/Rochas should be there right now. Due to a deal in the souk, where apparently neither the saleswoman nor I looked closely enough, it was overlooked that it was not a femme, but Madame. I only noticed the mistake at the moment of spraying on, because the scent immediately took me back to my childhood. But that night, I can come with you. When we are about to leave the apartment and my mother already stretches out her hand to the clutch (the very flat one made of light snake leather, which was only taken out of her cloth bag for concerts and into which only a few loose bills for the taxi fit next to a handkerchief, comb, key, the theatre tickets), she suddenly hesitates, pulls her hand back, disappears into her bedroom again and comes back - wonderfully fragrant for my child's nose. It is an adult, elegant fragrance, perfect for the occasion. Amazing what detailed memories a breath of Madame Rochas takes from the depths of the past and brings them into the present. In the left drawer of the little table my mother kept her handkerchiefs - which were embroidered or crocheted with lace for "beautiful", delicate webs. Beautiful, transparent and translucent, in my eyes (then as now) very unsuitable for their actual purpose. A sprayer of "Madame" was always applied to one of these cloths - and so the silk lining of the theatre bag had already absorbed the scent itself, so that each time it was opened and closed it would release the bag in a small cloud of scent. And this little cloud delights me very much. The beginning is already lavish with aldehydes and not really my favorite part of the fragrance. Somewhat pungent, slightly metallic-fruity-floral in the first minutes, then arranged into an extremely tasty bouquet. Not a natural meadow bouquet, but an elegant, rather formal affair. Maybe a bouquet on a wedding table with orange blossoms, as the bride wears in her hair. Here, however, supplemented by luxuriant tropical fragrances, nicely neatly kept in check by a hint of bitterness and a more bitter herbaceous part, which forms a wonderful counterweight to the honey sweetness of the flowers. "Madame" stands on a bed of fine woods, a trace of vetiver adds a dash of green powder. I very much enjoy this spirit of the past, which so unexpectedly moved in with me, and welcome the surprise guest warmly to me! This perfume is a myth and a must have for a classy woman. In this elegant and a quite vintage bottle, very similar to the original one of the Sixties, there's a wonderful jus to discover little by little. I think that the key-word to describe this scent is DISCRETION. So, the opening neroli notes aren't too strong and vibrant but masterfully measured for a refine result. But let's smell the heart: it's a tripudium of very feminine notes such as the warm and sensual ylang ylang, the tuberose, the jasmin, the iris and the bulgarian rose. A wonderful and precious bouquet anyway not resulting too intoxicating or "screamed", but composed with discreption and mastery for a refined touch. At the base, the warm notes of the amber, neither too strong nor too medicinal or oriental, of the sandalwood, only suggested and of the musk. It's the timeless charm of the famous "chypre" accord recalling immediately a classy lady wearing a haute couture tailleur and a string of pearls. The sillage and the longevity are quite good, you smell good for hours although the scent isn't heavy. This masterpiece could be worn mainly in the cold or mid season, by day, maybe with an elegant outfit, just like a string of pearls. It's less suitable suitable in the hottest days, but why don't dare a touch of "Madame rochas" in a special summer night too, maybe with a very feminine dress ? Last but not least, the price: quite high but not over the top. it's money well spent for a milestone of perfumery. I understand the movement toward simplicity, and I realize that some people are turned off by "old" perfumes, but I have to say that after trying a few contemporary fragrances, I find it extraordinarily nice to don something as wonderful, complex, and unique as MADAME ROCHAS. This is a perfume. This is a creation. This was the product not of painstaking marketing analysis but of the art of perfumery. MADAME ROCHAS participates directly in the Platonic Form of Perfume. She opens as a slightly citrusy floral aldehyde and then moves through layer after layer of luxuriousness, finally ending in a powdery chypre drydown that lingers on and on with a substantial but not suffocating sillage. Every single stage in the development, even as the scent slowly fades away, hours after only light application, is stunningly beautiful. Wearing MADAME ROCHAS is a lesson in what the fine art of perfume has been, and I do hope that it will not disappear, slain by the procrustean forces of image-based capitalism which lead so many peddlers to focus entirely on package with scant attention to product. 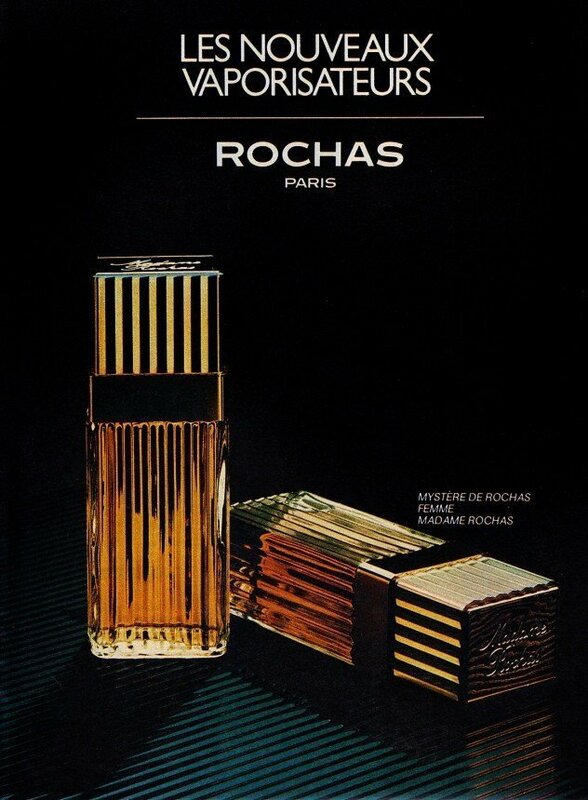 While there are many who lament the crime of reformulation, I must say that the reformulations familiar to me (including this bottle of MADAME ROCHAS and also ROCHAS FEMME, both reformulated in 1989), are still vastly superior to most of the first-run juices out there today. MADAME ROCHAS may not be a great office scent, but this is a great perfume. This perfume is a myth. Rich, warm, maybe a little "old style", but surely well composed and longlasting.